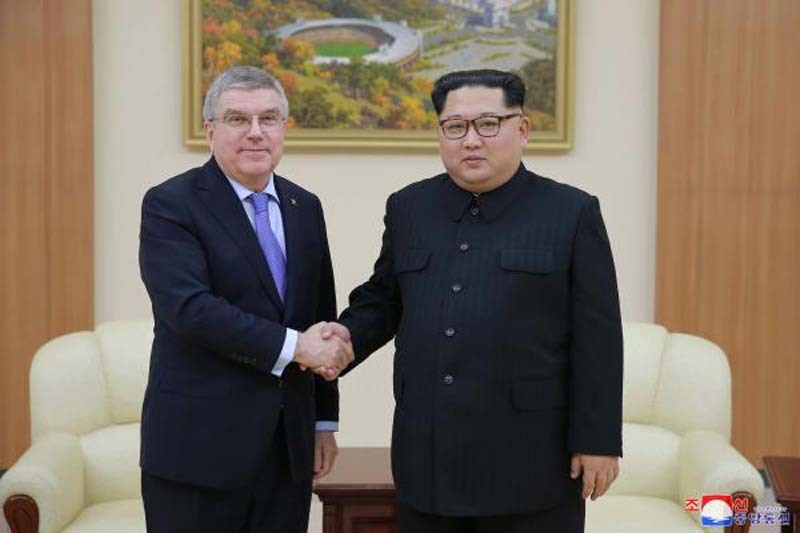 An undated photo released by the North Korean Central News Agency (KCNA), the state news agency of North Korea, shows North Korean leader Kim Jong-un (R) meeting with Thomas Bach, president of the International Olympic Committee (IOC) during his visit to Pyongyang, North Korea. Photo by KCNA. North Korea will take part in the next two Olympic Games held in Tokyo and Beijing, Intenational Olympic Committee President Thomas Bach said Saturday. [post_ads]Returning home from Pyongyang where he met with North Korean leader Kim Jong Un, Bach told reporters at a Beijing airport that the reclusive state's National Olympic Committee announced it will "definitely" participate in the Tokyo 2020 Games and the Beijing Winter Games in 2022, as well as in "all the editions of the youth Olympic Games." The IOC head said the decision was "fully supported" by Kim during their "very open and fruitful discussion" on Friday. "We had a very fruitful visit to the DPRK with good results and agreements in different respects," he said, according to Kyodo News. On whether South and North Korea would show a united front at the upcoming Games, Bach said the IOC will propose at the "appropriate time" that the two Koreas march together or take part in joint activities. South and North Korean athletes marched together under a united Korea flag at the Pyeongchang Winter Olympics' opening ceremony and formed a joint women's ice hockey team. North Korea's state-run Korean Central News Agency reported on Bach's meeting with Kim on Saturday. Kim reportedly conveyed his appreciation to the IOC for its sincerity and cooperation in helping North Korean athletes compete at the Pyeongchang Winter Olympic Games held in South Korea in February. He said the Pyeongchang Games was "meaningful" in that "it "laid a new chapter of harmony between the South and North," and provided an opportunity to "dramatically thaw frozen relations between the two Koreas." The North Korean leader is also said to have extended an invitation for Bach to visit the North frequently. The news agency added that Pyongyang had expressed its intent to participate in the Tokyo and Beijing, Yonhap reported. During his three day visit, Bach also met with North Korea's Sports Minister and National Olympic Committee chairman Kim Il-guk.